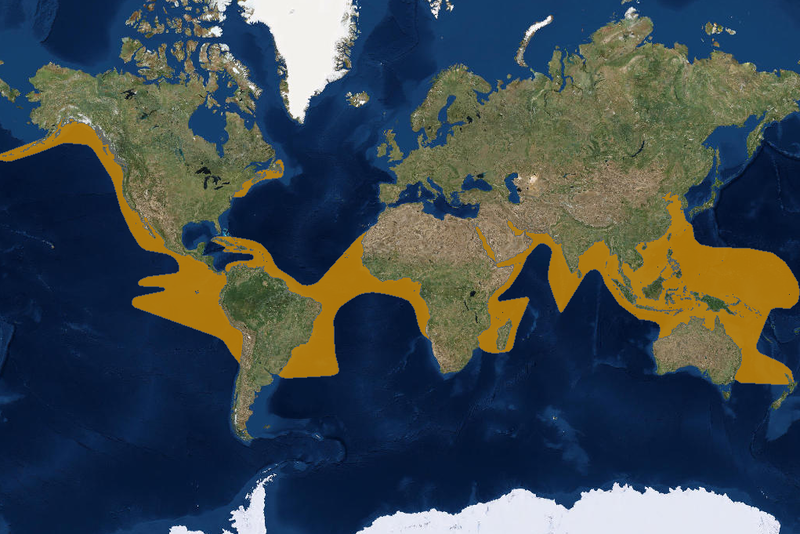 Yoshi has been exploring the Atlantic Ocean for 279 days now – what an incredible journey. Her pace is still a very steady 26km/day which is quite remarkable as she has really not made much use of the currents. She is currently about 580 km west of Swakopmund and right on the Walvis Ridge. I believe that Yoshi will be smart and avoid the fishing grounds, but I am certain that she is having yet another feast off this resource rich area. The surface temperature is a very acceptable 19’C with very little current. Yoshi’s tag has provided us with fantastic information. It has sent over 8000 positions through 1617 satellite passes. Yoshi is about 545 km NW of Pemba, the Olive Ridley turtle released off Mabibi by the SAAMBR team in March 2018. 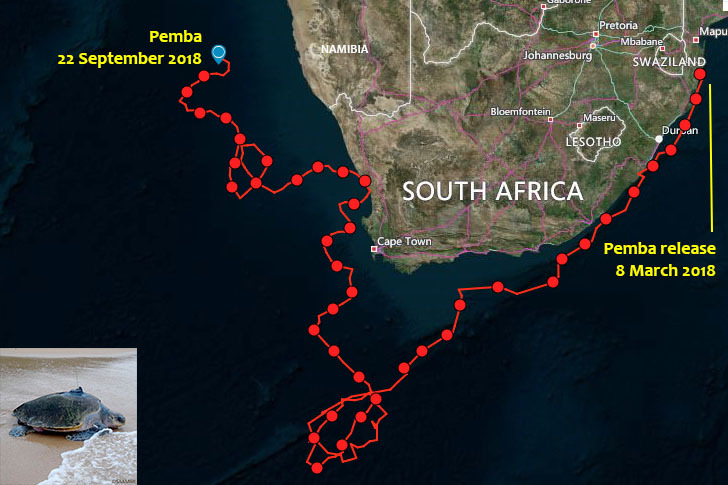 Pemba seems to be enjoying a gentle ride in the currents off Namibia and is currently moving slower than Yoshi. She has always been a smart swimmer, making great use of the currents – whereas Yoshi has been and active swimmer – often swimming against the currents (all the training in our Ocean exhibit clearly made Yoshi fit and strong – and of course her good appetite gives her energy to swim). Pemba has been back in the ocean after quite an extensive rehabilitation process at both the Two Oceans Aquarium and uShaka Sea World. She has traveled on average 36 km/day, but had an incredibly fast-pace start when she made use of that amazing conveyor belt, the Agulhas current. 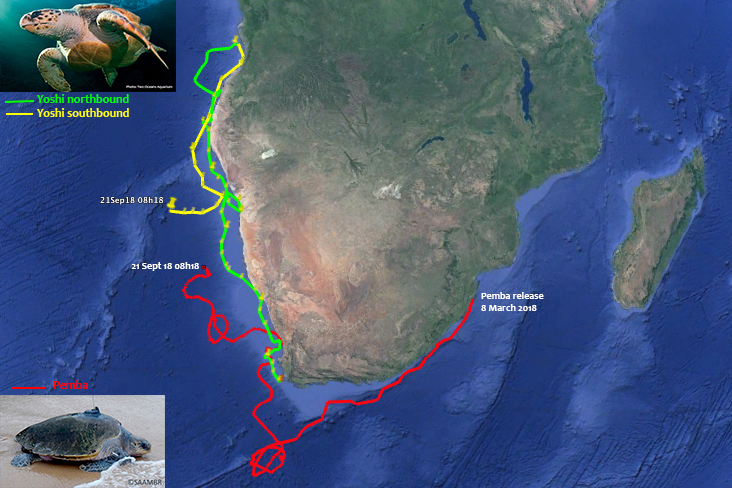 Both turtles have now traveled just over 7000 km’s each. I was expecting them to have passed each other by now – but Yoshi veered off to the feeding grounds at Walvis Ridge and Pemba has been in a more relaxed mode West of Luderitz. Pemba is in a slightly chilly 17’C water, so that would have slowed her down a bit as well.